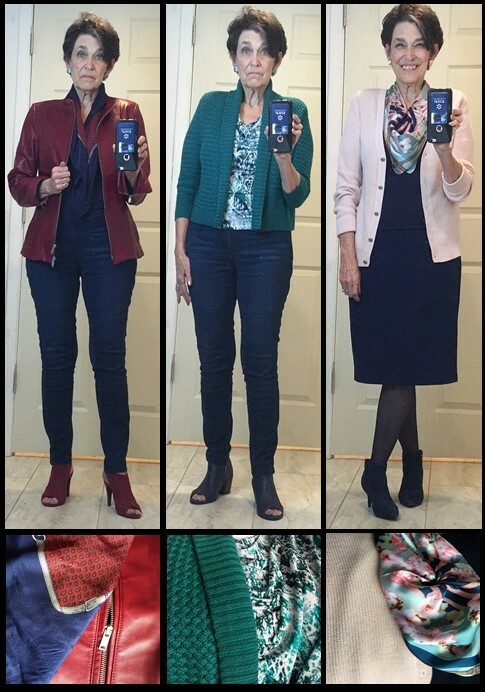 Still building new combinations — and really appreciating the versatility of solid-color garments and the importance of accessories to add polish to an outfit and to increase or decrease the dressiness of a combo. Just the change from a sleek to a chunky shoe or from a silky scarf to a crinkle gauze one can entirely redefine the mood of an outfit and make it right for a different occasion. I’ve used this red leather jacket with black and with brown … here it is with navy. 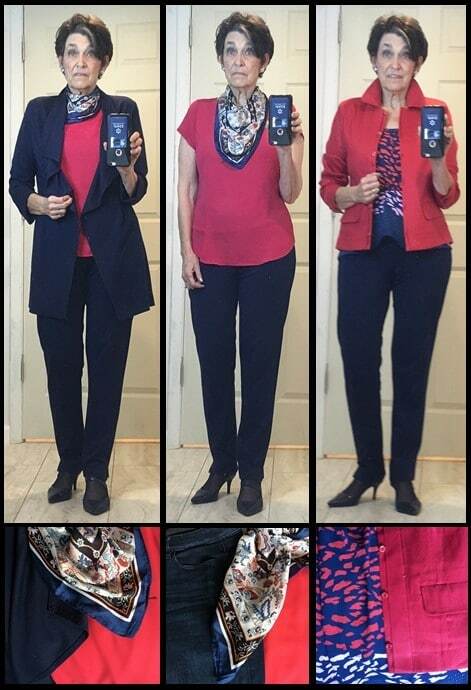 This photo shows dark wash jeans, but the combo works equally well with classic navy ponte pants or skirt. And this particular scarf can also link in a taupe shell instead of the navy one I used here. For a sportier look I could substitute my chunky navy booties for these red ones that match the jacket. Same dark-wash jeans with a shortie jade green sweater (love the interesting stitch variations) and one of my few print tops underneath. One of my print criteria is having multiple shades of the color so blends easily with a variety of solids. An undefined dark neutral is another helpful print element – see how the dark areas in this print can appear black or navy. This combo was inspired by the scarf – a brand new item in our inventory. Navy skirt and shell, blush sweater. Also works with dark jeans or navy pants, of course. (That means these 3 combos in this panel actually represent 9 variations!) Navy items can be so tough to match/blend, so instead of opaque tights I substituted a semi-sheer which created a less defined leg color. A previous navy grouping forced me to admit that my super-cute navy oxfords just weren’t comfortable enough … and precipitated a search for more realistic (for me) navy shoes. The Harlem bootie (Journee) has a perforated leather upper and open toe, a chunky heel for support and a padded inner sole. Great with jeans or other casual outfits. Available at DSW.com. Soft suede upper gives the Epigram bootie (Aerosoles) wiggle room to stay comfy for hours and the sleeker design make it ideal with dressier outfits. Google shows several retail options in scattered sizes. 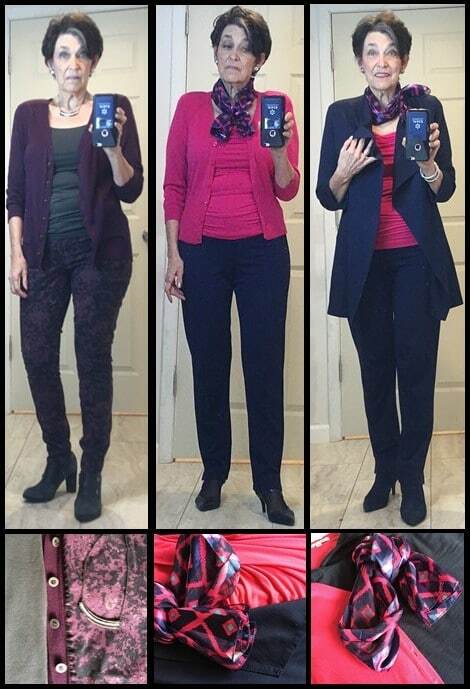 Casual day again – berry/gray print jeans, gray cami, berry sweater, chunky gray bootie. The discovery here was that these jeans – while cute – don’t have the stretch factor I’ve become accustomed to (spoiled by) in my other pants and I’m rotating them out to my favorite resale store for someone else to enjoy. Do take note of the necklace. It’s a new item in our inventory — available in silver/pewter mix, gold/silver and gold/brass — that’s a great basic to elevate both causal and dressy outfits in an instant. I love the versatility 2-piece matching top sets. This draped tank and shrunken cardigan can work as a set like you see them here, and I can also wear the tank under a navy jacket (shown tomorrow) or the cardigan over navy bottoms and tank. Once again the linking scarf pulls the whole thing together. Same combo as yesterday, just substituted navy ponte cascade jacket. See how easy this can be? Good thing, because you’re also seeing how lazy I can be – thanks goodness a well-curated wardrobe works so effortlessly. Rolling along on this navy theme – this time with a strawberry red cap-sleeve shell. This scarf and the navy/blush one above are mid-size squares rather than my typical oblong. See ideas for tying scarves of that size HERE. Finally hit a warm spring-like day, so this is yesterday’s combo without the jacket. Still feels too early to top it with my off-white jean jacket — but hopefully it won’t be long. And the same little scarf will pull that combo together. A cute new addition, this print cami from the current Cabi collection is the perfect link for my red linen jacket and navy pants, skirt or dark jeans. It was a bit too long for my short frame, so I tucked a bit of it into the waistband, creating some drape to the silhouette. See more about that jacket choice HERE. What wardrobe “ah-ha’s_ are you finding in your own closet? Please do share!